Bhima, your thought is like the shade of the peepal tree. In the last few years, every December 6, TV channels have been covering the annual gathering of thousands of followers of Dr B.R. Ambedkar at Chaitya Bhoomi in Mumbai. The middle class deems these events irrational or emotional and criticises them for causing traffic jams and littering—opinions that strangely resonate among social scientists. Most people do not reckon that the prolonged Ganesh Chaturthi affairs are also a nuisance. Many intellectuals, barring a few, see these gatherings of the Dalit public as a process of the ‘deification’ of Ambedkar or the ‘manipulation’ of the masses by the Dalit leadership. It is also common to see Ambedkar’s ‘rationality’ contrasted with the ‘irrationality’ of these gatherings, suggesting that Dalits are not carrying forward Ambedkar’s true legacy. In fact, much before Ambedkar belatedly emerged as a national icon in the 1990s, much before the Bharat Ratna, and well before Mandal, it is these annual gatherings that kept alive Ambedkar’s life story and work. This was well before the emergence of Dalit literature and before the writings and speeches of Ambedkar gained currency. 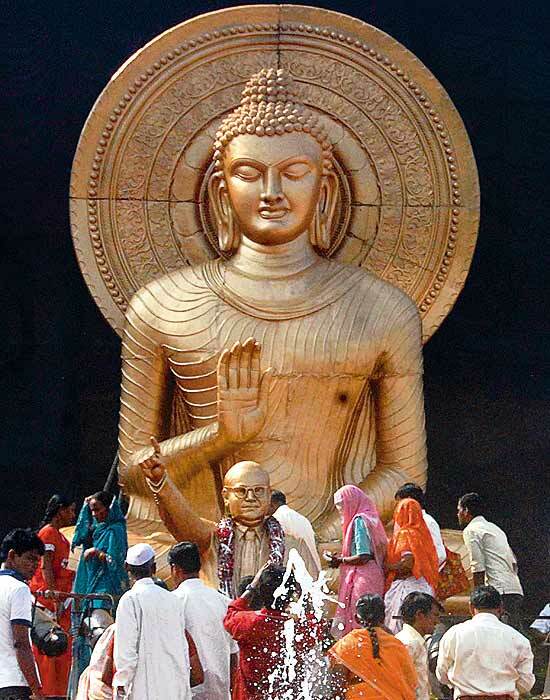 The key dates in the Ambedkarite calendar are: December 6 (Ambedkar’s death anniversary), observed at Chaitya Bhoomi, Mumbai; October 14 (the day he converted to Buddhism), observed in Nagpur; January 1 (the day in 1818 when Peshwa Bajirao II, the Brahmin ruler of Pune, was defeated by the British with support from Mahar soldiers), observed at Kranti Stambh, Bhima-Koregaon; December 25 (the day Ambedkar and his follower burnt a copy of Manusmriti), observed at Mahad; and, of course, April 14, Ambedkar’s birth anniversary. Shahirs used dominant idioms of the day, including Savarkar’s works, subverting them to highlight Dalit awakening. 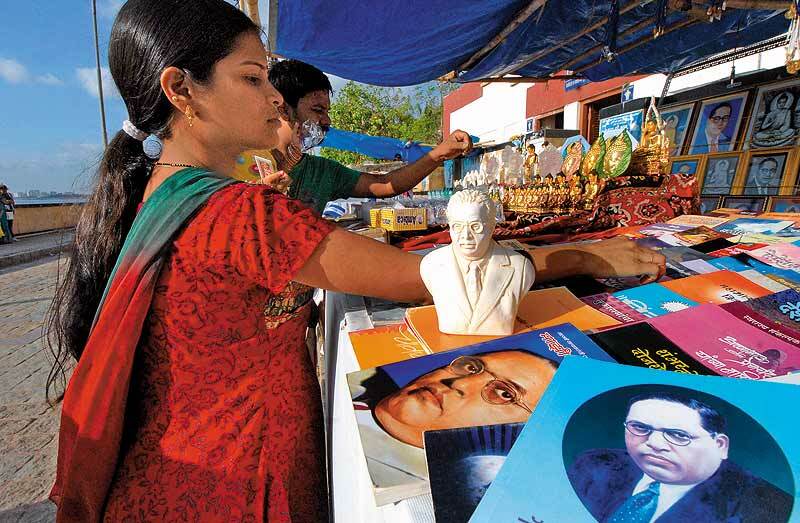 These annual gatherings spawn hundreds of stalls selling a wide range of items: brassware from Moradabad, Jai Bhim caps, statues, posters, calendars, prints of Ambedkar, statues of Buddha, lockets, watches, ribbons and night lamps with images of Ambedkar. 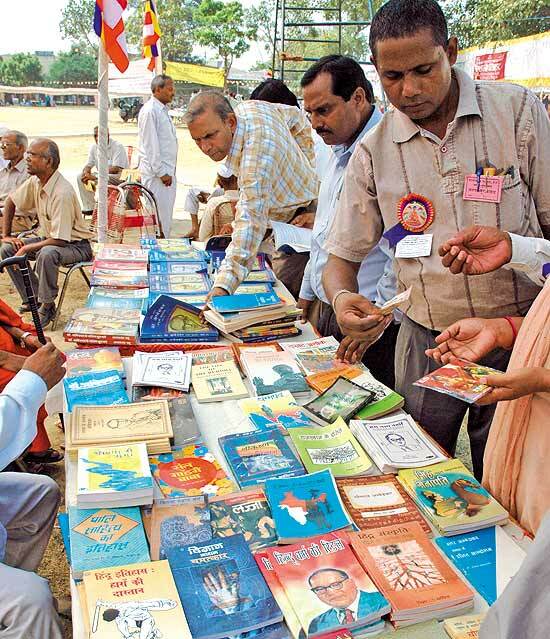 Many stalls sell the Ambedkarite calendar/almanac published by Dalit political organisations or publishing houses. These calendars are visually distinct, with covers in different styles, establishing a historical legacy from Buddha, Phule and Shahu Maharaj down to Ambedkar. Each of these calendars is a documentation of history, marking each day as a day in the history of Ambedkar’s life and struggles. At a time when the story of Ambedkar and the Dalit movement were kept out of textbooks, these calendars played an important role in cataloging and interpreting the history of Ambedkar’s movement. At these gatherings, two kinds of stalls—bookstalls and stalls put up by gayan parties, or singing troupes, selling cassettes and now audio CDs—predominate. Booklets and music have been the two media that have carried forth the life and work of Ambedkar. Following the Dalit Panthers movement of the 1970s and later, the movement to rename Marathwada University as Dr Babasaheb Ambedkar Marathwada University, several small publishers dedicated to producing literature by and on Ambedkar emerged across Maharashtra. 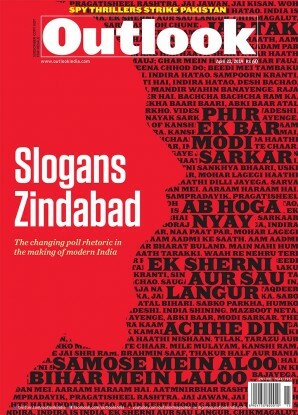 Many of these booklets introduce readers to the Ambedkarite perspective on contemporary issues. The books do not necessarily become individual possessions but circulate among members of the extended family, local Buddha Viharas and friends. Ujwala Dheewar, a 21-year-old interviewed at Chaitya Bhoomi, says she gifts copies of Ambedkar’s The Buddha and His Dhamma to friends to mark important occasions. She buys the book in bulk at these gatherings. Anantrao Ahire, an 80-year-old who was at the Yeola conference in 1935 when Ambedkar declared his decision to convert, says that on Ambedkar’s death in 1956, he resolved to sell Ambedkar’s books door-to-door for the rest of his life. The gayan parties, which constitute the second-largest number of stalls at these gatherings, may be traced to the bhajan mandalis of the pre-Ambedkar era. Since the Mahars had been traditionally associated with singing, there were several mandalis which sang compositions in the Varkari tradition—the bhakti cult of Vithoba of Pandharpur, about whom Namdeo, Dyaneshwar, Chokhamel and Eknath have sung. With the expanding reach of Ambedkar’s message, there was a dramatic change in the bhajans and in women’s compositions like the ovi (songs of the grinding stone) and palana (songs of the cradle). They all adopted the political tones of Ambedkar’s struggles and campaigns. All of us Mahars, Mangs, Bhangis and Chamaars—let’s condemn the name ‘Harijan’! Hearing the name makes my mind sad! And this dominating Congress government, it claims to run a democracy! and we in our place. when it has no trace of humanism? 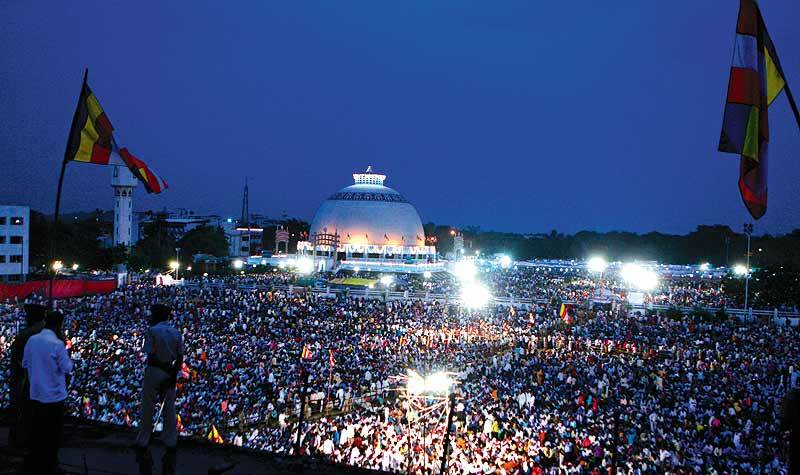 Kalapathaks and jalsas became central to the Buddhist conversion movement as well as the land-grab movement led by the Ambedkarite leader Dadasaheb Gaikwad in 1959 and 1964. The jalsa troupes began to close down in the mid-1970s and a new generation of gayan parties or qawwal parties emerged. These troupes travel throughout the year, extensively from April 14 (Ambedkar’s birth anniversary) to the end of May (Buddha Poornima) chiefly performing Geet Bhimayan, a dramatised and lyrical performance of the story of Ambedkar. Buddha geets and Ambedkar geets form the other popular aspects of the programme. In the 1990s, audiotapes, locally produced and inexpensive, expanded the reach of these songs. More people felt encouraged to form gayan parties. This led to a revolution in quantity and variety in music. More women singers and troupes became prominent without eroding the popularity of live performances. The Poona Pact is presented in the compositions as an intellectual akhada with the two great men, Gandhi and Ambedkar, engaged in a cerebral wrestling match. The compositions dwell upon the “unethical and morally incorrect” behaviour of Gandhi in withdrawing from a signed agreement. The chorus underlines the defeat of Gandhi (Gandhi harla) and his betrayal of the excommunicated communities. The interesting and repeated theme in the compositions on the Poona Pact is the request made by Kasturba Gandhi to Ambedkar to grant jeevandan (boon of life) to Gandhi. The educational background of the artistes ranges from as little as Class IV to Class XII. There’s a predominant presence of women singers in the new gayan parties, and some of them, like Satyabhama Kokate, are illiterate, while others like Maina Kokate are educated up to Class VII. Every party has four to ten members. Most of the members have to struggle to make ends meet and look for supplementary sources of income. The promoter of ‘Asha Gaikwad & Party’, popularly known for the audio cassette Amhi Bhimachya Nari (We, the Daughters of Ambedkar), was an agricultural labourer before she formed her own gayan party. The chorus underlines the defeat of Gandhi, his betrayal of Dalits. Kasturba then seeks jeevandan for Gandhi. Dalit pamphlets came into being much earlier, but what the 1990s brought forth was a robust flowering of interest in Ambedkar’s writing and struggles for the emancipation of women. Booklets on Ambedkar and women’s liberation began circulating in the 1990s, enabled by the events of the period, including the rise of autonomous Dalit women’s organisations, the formation of national-level federations and forums of Dalit women, and the subsequent revival of the women’s wings of Dalit political parties. Many writers of these booklets are concerned with Ambedkar’s views on women’s liberation and delineate Ambedkar’s efforts in drafting laws such as the Mines Maternity Benefit Act, when he was the labour member in the Viceroy’s Executive Council (1942-46). Some booklets highlight his recovery of the Buddha’s legacy of feminism and see Ambedkar’s critique of Brahminical practices, including sati, child marriage, and institutionalised prostitution, as one of the early theoretical statements on violence against women in India. Thus, when conclusions about the emotive iconisation of Ambedkar are being drawn, the dynamic gatherings around the Ambedkar almanac tell another story. The invaluable labour of “mudhouse cultural activists” (as political theorist Gopal Guru calls them) has for long remained unsung. The mudhouse print and music cultures and their popularity have made an immense contribution to sustaining the memory of Ambedkar’s life and works.